Armstrong Energy is a leading supplier in servicing the power industry and specialises in the production of parts for the mining, power generation, oil and gas, military and medical industries. 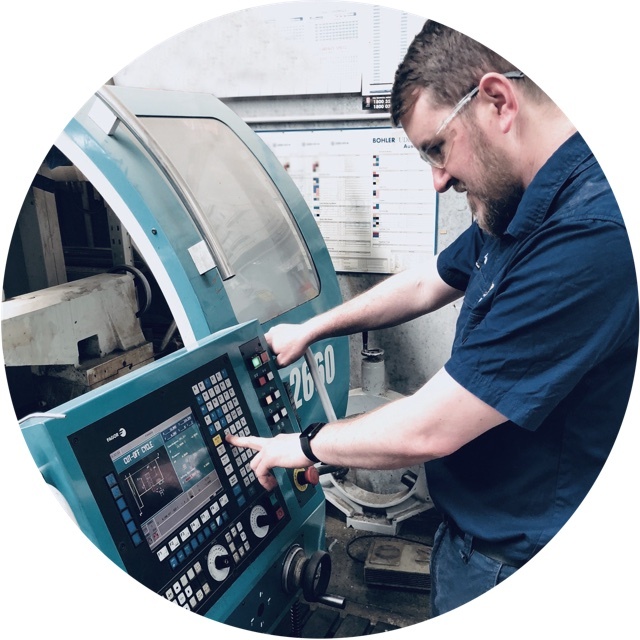 We have a can-do attitude backed up by more than 20 years experience delivering precision engineered parts and materials to meet your requirements and deadlines. Daniel Price is the new managing director and shareholder of Armstrong Energy. Before purchasing Armstrong Energy in 2017, Daniel worked in numerous (all but one!) roles throughout the company. He began his Armstrong journey as a humble storeman, and was ultimately promoted through numerous roles, leading him to company manager prior to ownership. His movement throughout the company, as well as his decade’s worth of experience makes him a jack of all trades within the business. Daniel is a member of his local football team and attempts to play mixed netball at his local rec center. Daniel’s has multiple certifications including Engineering Tradesperson Certificate (Mechanical). Kenneth commenced his industry journey in the 70’s, dealing specifically with electrical industrial materials. He joined the team at Armstrong Energy in 1999 in the role of Technical Sales, specialising in electrical components. Over the years, he has introduced AE to the electrical, medical and defence sectors throughout Australia, all in which we still service today. His 40+ years’ experience displays his vast knowledge of industrial materials, and in choosing the right material for the right application, his opinion is second to none! Kenneth is known for his ‘can do’ attitude, and witty personality in which he kindly shares with all. Chris commenced at Armstrong Energy in 2007 with the job title of Technical Sales, specialising in mechanical parts. His hard work also expands to customer site service measurement and maintenance, solving customer mechanical problems and ensuring safety on site. He has been in this role for over 10 years and undertaken further learning including but not limited to, his Machining Trade Certification. Chris has an incredible attention to detail, in which he displays in his meticulous work. He is also a huge sports fan and family man. Troy commenced his Armstrong Energy journey this year, in the role of internal sales. Troy has over five year’s industry experience, specialising in engineered plastics. Troy also has many years customer service experience, in which he brings to our team. Troy is known for his huge love of sports and exceptional football talent. Jamie is the numbers man at Armstrong Energy, specifically dealing with accounts and company growth and development. Jamie has a Bachelor in Commerce and has over six years experiencing working as an Accountant. In his spare time, Jamie is currently completing his final unit to register as a Chartered Accountant. Jamie is known for his love of numbers, excel spreadsheets and appreciation of food. We attained ISO 9001 Quality Assurance (QA) certification in July 2011, demonstrative of our commitment to satisfy our clients’ requirements throughout all aspects of the supply chain; whilst implementing a comprehensive management system representative of the business principles and strategic pathway to success. We've been at it for 20 years, and we're just getting started. Today, Armstrong Energy remains a leading supplier in servicing the power industry and specialises in the production of parts for the mining, power generation, oil and gas, military and medical industries both in Australia and abroad. We also provide cut to size plastics, custom machine components and arrangement of seals. Armstrong Energy is committed to providing value added products and services by responding to the needs and requirements of our customers in an innovative, efficient and cost effective manner. Armstrong Energy has grown and diversified into many areas of manufacturing and distribution of specialty parts including clamps, filters, gaskets, joints, moulds, nozzles, o’rings, plugs, screens, seals and washers. We also manufacture and supply safety equipment, tools and electrical accessories. Our workshop is comprised of cutting edge equipment & technology which enables a streamline production process, turning over jobs expeditiously on high demand. Some of our equipment includes manual and NC lathes, mill, hydraulic press, vulcanising and cutting facilities. The equipment & supply chain we possess, allows us to be highly adaptive to a large range of consumer requests which epitomizes our strategic goals as a business.